Many triathletes struggle to improve their swimming, biking, and running at the same time. The large volume of training necessary to improve means that you experience a high level of general fatigue. This means you have a very limited capacity for breakthrough workouts. This is particularly difficult for athletes training for a 70.3 or IRONMAN, where the hours spent training are significant. Rather than struggling to hit several key sessions per sport per week, you will have better results by focusing your efforts on a single sport. This article will focus on how to perform a bike focused training block. The reason behind focusing on a single sport, in this case the bike, is simple. When you try to balance all three sports it becomes difficult to balance quality with quantity. Due to general fatigue, you will only have a few key sessions per week. If these sessions are in different sports, you are likely not creating enough of a specific overload. By focusing your quality sessions in one area, you generate a greater specific overload which will elicit a greater adaptation in shorter time period. Think of it as accelerated training. Many athletes are worried that if they focus on cycling their run and swim will suffer. However, since you are not losing aerobic fitness, so your run fitness won’t suffer. What you will notice is a slight decline in your neuromuscular patterning and some muscular endurance. Additionally, during this time you can focus your swimming on perfecting your technique and utilize more swim tools like paddles and a buoy to save your legs a bit. This is just enough to keep you in touch with running and swimming while saving the quality sessions for the bike. The key to remember during this block is that added volume and duration are not the main goals. The objective is to increase the quality of your cycling sessions. While that may include additional volume, for many it means pushing yourself harder to achieve a new level of training overload. For a typical bike block, you should have three days that are devoted to quality bike sessions. While this is season dependent, typically you should perform two weekday sessions aimed at improving your aerobic capacity or strength. This could be the classic 2 x 20 at Sweetspot power or heart rate on Tuesday, then a big gear/low cadence workout on Thursday. Each of these workouts can be done in 60 to 90 minutes, making them easier to fit in during the week. The weekend, preferably Saturday, is then left for your long ride. The goal of this ride is not to simply ride long. Incorporate some race specific details into this ride. If the course for your A race is hilly, ride in the hills and focus on staying smooth. If it’s a flat course, stay in your aerobars for long periods of time. This is also a great time to dial in your race nutrition and hydration. During these blocks, you should place extra emphasis on your limiter. For instance, if you have a hard time producing force on the pedals, perform more strength building sessions. If your back and neck hurts after 60 miles, get a bike fit and spend more time in the aero position. If you find that your legs go out after 80 miles, extend your Saturday ride. Don’t get caught up in simply riding more. How long these block should be depends on how far away your A race is, your current fitness, and how much you want to bring up your cycling. At the start of a focus period, you should do a test (Functional Threshold Power or Heart Rate) to set a benchmark. Then, give it a minimum of four weeks, preferably six to eight, and then test again. Gauge your improvement and then decide if you want to continue with the focus or return to balanced training. Remember, you can always do another bike block later in the year. Working with a coach can help you dial in the duration and timing of these blocks. When in a bike training block, the brick run is a great way to keep in touch with your running. Keeping these runs to 15 to 30 minutes will minimize fatigue while performing race specific work. So while the volume of your running may be lower, the specificity is much higher. If possible, it is also good to perform a swim/bike brick during your Saturday long ride. There is a big difference between having breakfast and coffee, reading the paper, then starting your long ride and swimming for 30 minutes straight and then getting on your bike. This specific block is great for helping you perfect your race day nutrition. After a bike focus, you can either return to more balance training, or perform a swim/run focus. Due to the smaller number of hours needed in each sport, and since swimming is not as physically punishing, you can combine these two into a single block. The same principles apply for this block as they do for the bike block. Quality sessions are your goal with an extra emphasis on what is holding you back. With the volume of training necessary for long course triathlon, too often quantity, and not quality, is the goal in training. 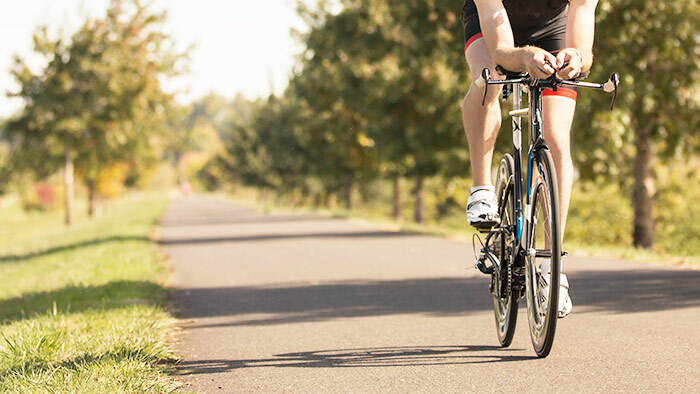 By focusing on the bike and maintaining your swim and run, you can make bigger gains than if you were trying to train hard in all three sports. Try this approach and see how it can work for you.